Home | Blog | Send some love with this cute Teddy cake. 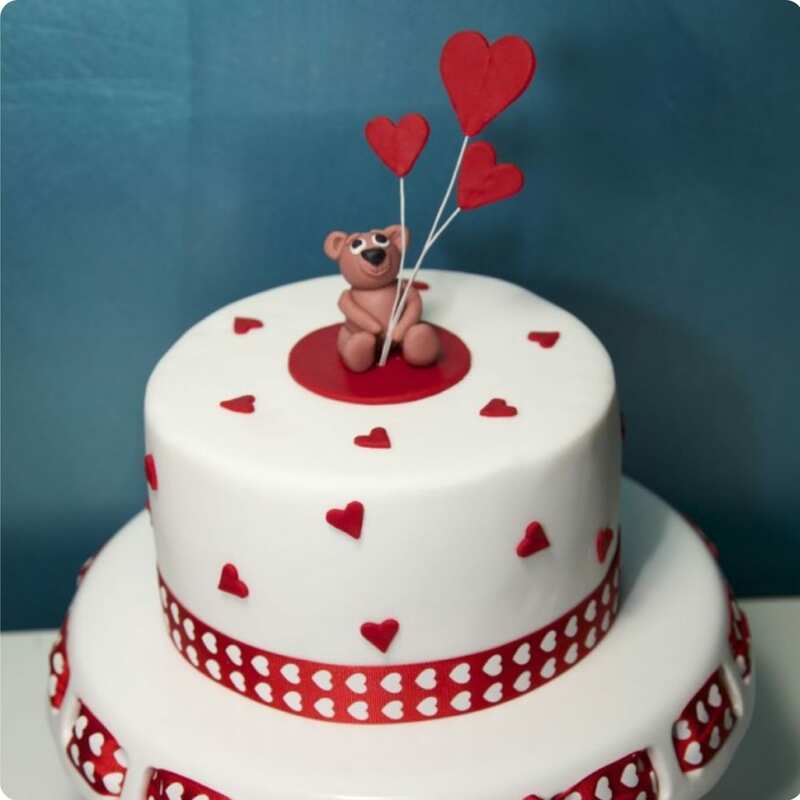 Send some love with this cute Teddy cake. Using white ready to roll icing I covered a round cake and then used little hearts cut out of red icing to decorate. I made the teddy bear a few days ahead to give him time to dry and harden so that he was able to sit and hold the heart shaped balloons. My cake was inspired by this image I found on the net and had saved on my computer to make one day. The perfect ribbon was already in my stash to thread through my ribbon cake plate and I added a band of the same ribbon around the bottom of the cake to match. A sweet, simple but effective cake that could be used for many different occasions like a baby shower, Valentine’s Day, a girls birthday or teddy bear’s picnic. A beautiful cake that anychild or adult would love! Thanks! This is wayyy too cute to eat!! how cute is this little guy! adorbs! Very pretty! Would love the recipe for the cake if possible…. Very effective! I have just started decorating with fondant. Very thoughtful of you. This is a great cake! Wow I really love this..soo cute.thanx. Nice and simple cake to make. I just love the cake plate. Where do you purchase them from? Absolutely beautiful cake…sooo cute …also hoping your little friend is coming along in leaps and bounds.